If you are looking for information on the Manhattan Bagel franchise business opportunity, Manhattan Bagel franchises or Manhattan Bagel franchising, then you have come to the right place. Manhattan, the city, has always been the great crossroads of the world. A city where many paths converge to make its experience unique, while at the same time creating an aura that is broadly appealing. That is also the essence of our story. We have combined the baking heritage of our beginnings with our customer's desire for varied and interesting flavor sensations to create a uniquely appealing place featuring traditional as well as contemporary selections for breakfast and lunch. Unparalleled breakfast offerings, combined with a compelling lunch program, gives guests a reason to visit all day long. 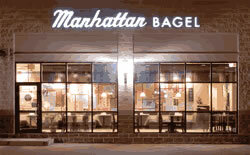 Manhattan Bagel® is currently seeking franchisees with the ability to open and operate up to 3 units. Once your eligibility has been determined by the Manhattan Bagel Franchise Team, you are on the path to owning a Manhattan Bagel franchise. Manhattan Bagel will be there to assist you from site selection to your grand opening. During construction of your franchise unit, you and your managers will undergo extensive training at Bagel University - a fully equipped training store and classroom facility. The program combines classroom instruction with practical "hands on" applications. You will graduate with valuable knowledge and experience obtained from the Manhattan Bagel team of skilled instructors. This will be followed by on site assistance at the time of your store opening. A Manhattan Bagel Franchisee can rely on a support system designed to produce positive results. Our training program ensures that all facets of food safety, product preparation, baking, customer service and other key components to your restaurant operations are covered and fully demonstrated. Our Operations Training Manual provides you with the knowledge that will help you operate your Manhattan Bagel restaurant efficiently. The Manhattan Bagel marketing & advertising programs are excellent. Our Marketing Team will teach you how to implement programs for grand opening, community relations and local store marketing. They continually work to formulate strategies to heighten Manhattan Bagel brand awareness through promotional materials and other media.